What makes Crest better than Colgate? Pity the copywriter whose job it is to come up with … something. And the car journalist whose job it is to explain what makes crossover A superior to crossover B. The theme song from Weeds plays… . But, every now and then, they throw you a bone. Something different to hang your hat on. Like two different wheelbases and seating configurations (five or seven). 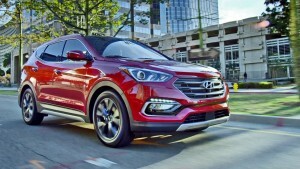 The Hyundai Sante Fe is the only crossover that comes more than just one way. It’s available in Sport trim – with two rows of seats and room for five and an available high-performance turbocharged four cylinder engine. Prices for this version of the SF begin at $25,350 for a front-wheel-drive version with the base (not turbocharged) 2.4 liter engine. With AWD, the MSRP is $27,100. With the optional turbo 2.0 engine and FWD, prices start at $31,700 – topping out at $38,250 for an AWD-equipped Ultimate trim. Or, you can buy the longer wheelbase – and three row – regular Sante Fe. It has room for seven – and comes standard with a V6. Prices for this version of the SF start at $30,800 with FWD and top out at $41,150 for a Limited Ultimate trim with AWD. Possible cross-shops include the Honda CR-V, Toyota RAV4 and Ford Escape – but none of them offer a third row seating option and neither the Honda nor the Toyota offer an engine option. The 2017 Sante Fe gets a number of tech updates, including two new flat screens (five inches standard in the Sport; eight inches optional/standard in the long wheelbase SF) with new apps, including Android auto. 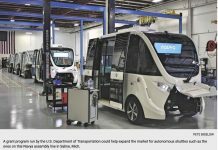 Both versions get (or offer) new “safety” technologies, including lane departure warning and automatic braking, as well as a 360- degree park-assist camera. The front and rear clips get a facelift, too. Peppy – or practical. And both at the same time. 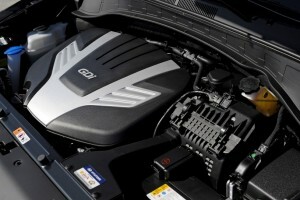 Much more standard – and available – engine than rivals like CR-V and RAV4. Can tow up to 5,000 lbs. (V6 models) which completely outclasses the four-cylinder-only competition. Two-row Sport’s available turbo 2.0 engine delivers almost the same gas mileage as much-less-powerful standard 2.4 liter engine. 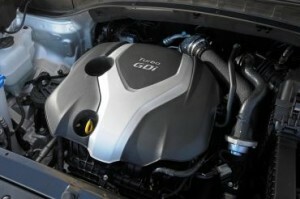 V6 Sante Fe is a gas guzzler – best case (with FWD) is 18 city, 25 highway. 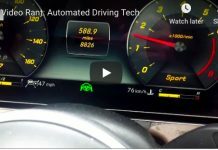 “Safety” systems – lane departure warning and automatic braking – are uber-nannyish. 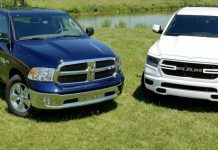 Many automakers are paring down their engine lineups. For example, the Toyota RAV4 no longer offers anything but a small four (it used to offer an optional V6). The Honda CR-V is also four-cylinder-only. The Sante Fe, in contrast, offers three engines. Standard in the regular wheelbase/five passenger Sport is a a 2.4 liter four that produces 185 hp – already, more power than the CR-V’s take-it-or-leave it 185 hp 2.4 liter engine and the RAV4’s that’s-all-there-is 176 hp 2.5 liter engine. 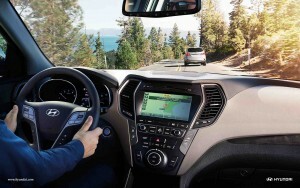 It’s also more than you get in the base trim Ford Escape, which comes standard with a 168 hp 2.5 liter engine. Next up (in Sport trims) is a turbo 2.0 four – and it makes 240 hp. This completely outclasses the CR-V and RAV4 – and also beats the Escape with its standard engine and its next-up 178 hp turbo 1.6 liter engine. 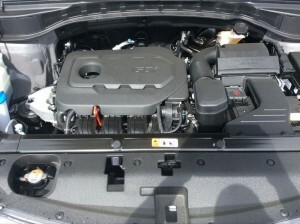 The Escape offers a 240 hp turbo 2.0 engine but it’s three steps up the trim (and price) ladder. 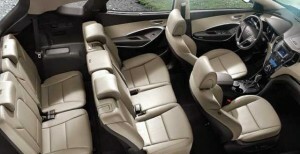 The long wheelbase/seven-passenger Sante Fe comes standard with a 290 hp 3.3 liter V6. 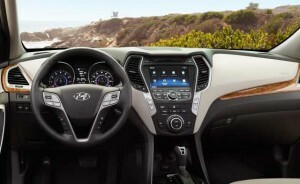 All Sante Fe engines are paired with six-speed automatics, but you can go FWD or AWD with any of them. You can get a comparably powerful V6 in something like the Chevy Equinox – which is available with a 301 hp, 3.6 liter V-6. But the Equinox – which is larger than the regular wheelbase Sport Sante Fe but not quite as large as the long-wheelbase Sante Fe – does not offer seven passenger seating. 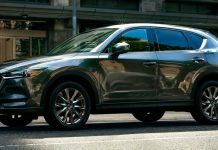 To get that, you’ve got to up-size to something even larger, such as a Chevy Traverse (or the Mazda CX-9, which is now a four-cylinder-only ride). Mileage with the four is mediocre: 21 city, 27 highway with FWD and 20 city, 26 with AWD. The Honda CR-V and Toyota RAV4 may not outrun the Hyundai but they can run a lot longer than the Hyundai without stopping for fuel: 26 city/33 for the FWD CR-V. But the Hyundai’s optional 2.0 engine gives you much more power (and much better performance) with about the same gas mileage as the slow-pokey (and thirsty) 2.4 liter engine: 20 city, 28 highway with FWD and 19 city, 26 highway with AWD. The turbo’d Sante Fe can scoot to 60 in about 7.4 seconds (FWD; AWD versions take a tenth or two longer), which smokes the CRV and RAV4. Ditto the four-cylinder-powered Equinox, which – like the other two – takes nearly 10 seconds to get to 60. Only one same-sized competitor runs quicker and gets better gas mileage – the 2.0 turbo’d “Ecoboost” version of the Ford Escape. It can hustle to 60 in the mid-high sixxes and manages 22 city, 30 highway (FWD versions). But, you can’t have that great performance (and gas mileage) and seven seats, too. Because like all the others in this class, there’s no third row. 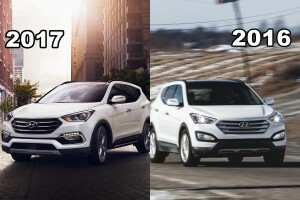 Unfortunately, the rumor – encouraged by Hyundai at the time of the Sante Fe’s launch – that the punchy (and not too hungry) turbo 2.0 engine would be offered as an option in the three-row SF has not panned out. The bigger Sante Fe comes standard – and is only available with the 3.3 V6. Performance, though, is excellent: zero to 60 in 7.6 seconds. Remember: It is bigger and heavier than the Sport. Also, this version of the Sante Fe can also pull 5,000 lbs. – much more than the 1,500-3,000 lbs. that’s typical of crossovers in this general class. 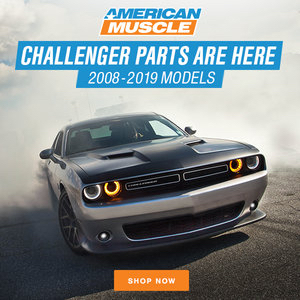 The V6 is also inherently simpler (and so, likely less problem-prone over its life) than the pressurized turbo fours that are rapidly replacing sixes in vehicles of all types, due to pressure to meet the government’s mandatory MPG minimums. I test-drove a Sport model with the 2.0 turbo engine – which (slight tuning differences aside) is basically the same excellent engine found in other current Hyundais like the Sonata (and its corporate cousin, the Kia Optima). 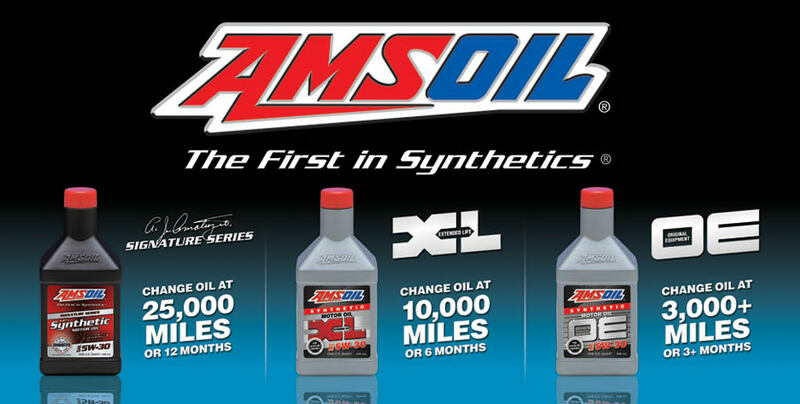 The key number to focus on is not horsepower but torque – 260 lbs.-ft., peaking at 1,750 RPM. This is almost 100 lbs.-ft more torque than the four-cylinder RAV4 and more than 100 lbs.-ft stronger than the CR-V’s standard (and only available) four. Plus, both the Toyota’s and the Honda’s torque peaks don’t arrive until 4,100 and 4,400 RPM (respectively). You have to work those engines to get anything approximating acceleration out of them. While 10 seconds to 60 isn’t awful in general terms, it is slow by modern car standards. The “bar” is around 8 seconds – to give a sense of things. The only thing in this class that’s competitive in terms of power/acceleration is the also-turbo’d Escape (270 lbs.-ft of torque) but, again, just the one wheelbase – and no third row. The only area where I’d say Hyundai hit a triple instead of a home-run is transmission-wise. There is nothing objectionable about the standard six-speed automatic that comes with every SF engine. It doesn’t shift too soon – or too late. I hardly used the driver-selectable manual gear change mode (or the Sport) mode because why bother? The transmission didn’t need any help from me. It knew exactly when to drop down a gear – and when to hold a gear. I never felt the need to over-ride its decisions. However . . . it’s still an automatic. And no matter how competently it shifts, how quiet it is – or how fuel efficient – it is not as much fun as working a clutch and stirring gears yourself. If you prefer a manual, you’ve got two possible alternative choices: The VW Tiguan and the just-redesigned Subaru Forester. The Tiguan’s appealing because it comes standard with a 2.0 turbo engine (200 hp) and a six-speed manual. The Soobie is less powerful (170 hp) but also comes with a six-speed manual as standard equipment. But – once again – neither the Tiggy nor the Soobie offer more than two rows of seats. The longer wheelbase/three row Sante FE is, however, a lot beefier than the two-row Sport: 3,964 lbs. vs. 3,459 lbs. Which is why it’s such a pig at the pump. 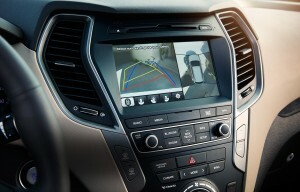 Then again, so is the V6 Equinox. Even more so: 16 city, 23 highway. You’d do better buying a V8-powered real-deal SUV like the Chevy Tahoe. The seven-passenger SF isn’t quite as big as three-row/seven passenger competitors like the Chevy Traverse, Ford Flex and Mazda CX-9. 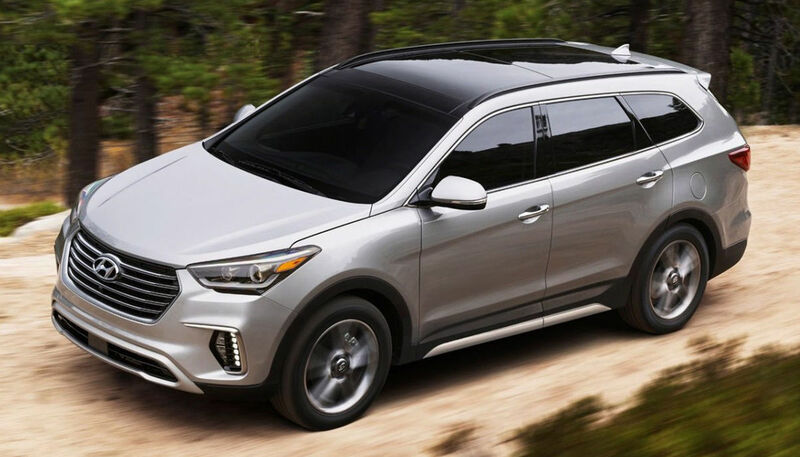 It is 193.1 inches long overall and rides on a 110.2 inch wheelbase – vs. over 200 inches long for these others (and just about for the Mazda, which is 199.4 inches long) all of which also have several inches more wheelbase (118.9 for the Traverse, 117.9 for the Flex, 115.3 for the just-redesigned CX-9). 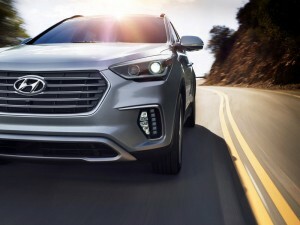 But – and here’s a surprise – it turns out the physically smaller on the outside Sante Fe actually has more second row legroom (41.3 inches) than the much larger overall Traverse (36.8 inches) and the CX-9 (39.4) and its cargo capacity (80 cubes) is only slightly less than the Ford Flex ‘s (83 cubes). Now, the Flex has really generous second row legroom (44.3 inches) and the Traverse has much more cargo room (116.3 cubes) but the SF splits the difference pretty nicely and may be just roomy enough – without being too big – for your needs and wants. And for those who don’t need that third row, there’s the regular wheelbase SF. The second row in this one is also very generous – 39.4 inches – and while there’s a bit less cargo capacity (71.5 cubes) these stats still stack up well when compared with the stats of other two-row-only crossovers like the CR-V and RAV4. And also mid-sized/three-row models like the new CX-9, which has 71.2 cubes behind its third row and exactly the same 39.4 inches of legroom in its second row. The two-row SF also has considerably more second row legroom than its most direct rival, the Ford Escape – which has just 36.8 inches of second row legroom. That’s 2.6 inches of difference – which is a noticeable difference. The SF also outclasses the CR-V (38.3 inches) and the RAV4 (37.2 inches) and absolutely mauls the VW Tiguan – which has a crumple-you-up 35.8 inches of second row legroom. That’s 3.6 inches of difference – a huge difference. Ditto the cargo capacity count: The tiny Tiggy has only 56.1 cubes of cargo space. Of course, utilitarian considerations aren’t most people’s only consideration. Style – and features – matter, too. Which, they pretty much do. It is getting really hard to tell one brand’s CUV from another brand’s CUV. None are disfigured. They’re just . . . derivative. I’d be willing to bet that the up-canted rear quarter glass from a new RAV4 would fit a new Escape, which would fit a CR-V . . . which would fit the new SF. Ok, that’s a bit of an exaggeration – but not by much. A coalescing sameness is spreading across the land. 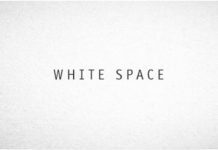 You have to squint hard to discern aesthetic differences – and identify one brand vs. another brand from say 50 yards away. Thank the motor gods for those helpful badges they glue to the tailgate. . . . I have no objection to this – other than the distorted (and limited) view to the rear – a consequence of the “fast” roofline and truncated (and also steeply slanted) back glass. The SF has this issue. They all have this issue. Inside, it’s modern and slick-looking (as is the case with Escape and the others, too). 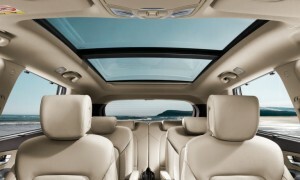 For instance, the AC vents built into the B pillars and the expansive (optional) panorama glass roof. I also like the side bolsters on either side of the center console – with a semi-hidden storage cubby in between. You can replace the second row bench with a set of captain’s chairs in the Limited. A heated steering wheel is available, too – and on all trims, including the base Sport. Unlike The Dude, I cannot abide the new “safety” features – the idiot-proofing features – being added to new cars. On the one hand, we are lectured about the perils of distracted driving. On the other, they keep installing chime and light shows that drive a sane person to distraction. The SF’s new (and, thankfully, optional) lane departure warning system hits you with a jarring chime whenever your tires tread upon the yellow painted line to your left or the white line to your right. In theory, you should always be in between the painted lines but in practice, in the real world, the line painters sometimes skew the lines and if you stay in your lane (rather than in between the lines) it beeps. And flashes. It does this again if you cross over the lines without signaling. Which means having to signal like an imbecile even when no one’s around – in order to avoid the chimes and lights. Then there is the Cloverific automated braking system – which aggressively applies the brakes when it rather than you decide this is needed. It does this when – as an example, a car ahead is turning off the road and has slowed to make the turn. You can tell there’s ample room such that by the time you get anywhere near the turning-off car, it will be gone – and so, no need to brake. If you’re not ready for it – and used to it – it can be… distracting. You can skip both, though. Thankfully. The 360 degree park assist camera, on the other hand, is cool. 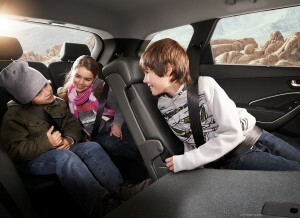 Even more cool are the available slide and recline rear seats. Hyundai’s still the only player in this segment that offers you a choice of wheelbases – and engines – in the same vehicle. Give Hyundai credit for stepping up to fill the “performance” niche, that RAV4 & CRV ignore. Obviously, performance isn’t a big priority for most compact CUV buyers. But I bet some folks will pick the Santa Fe, just to get a little pep. Glad they at least have that option. Don’t Hyundais still come with 10 year warranties? And I do applaud them for offering a performance option – two, actually. ^^And it’s only for the original purchaser. After you sell the car it becomes 5/60. Nothing like going to the lake with your fishing boat and the inevitable storm blows in. So everybody is at the ramp, maybe only 50 boats per ramp. First two boats pulled out soak the ramp. Then the FWD bunch shows up and as the trailer loads up as the boat starts losing buoyancy, the trailer is taking the weight and that FWD starts spinning tires and that’s fairly much it. If those old 80’s Toronado’s and Eldorado’s with big blocks won’t pull the boat out, how will this useless thing do so? Everything is fine as long as RWD vehicles are being used but get two of those FWD POS’s beside each other and the entire ramp is blocked. Then, some of those idiots don’t want to be pulled out and if they do, somebody has to drop their trailer, hook up to these city dicks(they don’t have a clue as to how to chain up)so you have to get wet with ever choppier water coming up the ramp. Then you get to pull their dumbasses out and they try to stop well before you’ve gotten them Out of the Way. Meanwhile, they drive away while everyone else is loading their boats while you hook back up to your trailer and things are getting rougher by the second. Nobody’s smiling except the people who’ve seen it too many times already and it’s laugh or cry. I am actually looking at a 3-row Santa Fe. One thing I like about the Korean twins( i.e. 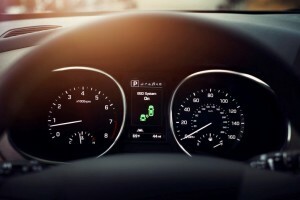 Kia/Hyundai), is that, so far, I don’t think they have the start/stop system I utterly loath. its getting harder and harder to avoid those, but I am determined to if I can. I realize the window is closing on that, with it eventually becoming standard on everything. TIP TO AFTER MARKET HACKERS: this looks like a potentially lucrative field, get busy…please! 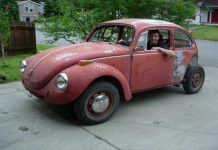 General rant: As I mentioned, I am currently looking for a new ride. For the first time in my life, instead of being able to look for what vehicles have the most of what I want, I feel like I am being forced to choose among the vehicles that have the least of what I DON’T want, including stop/start, intrusive safety systems and , for me, turbos. This is a very negative approach and one that leaves a sour taste in the mouth. It really takes away from what used to be a fun experience. I do understand Detroit is only doing what it has to do to please the absurd government mileage mandates. On that score, everything indicates that gas prices will stay low for the anticipated roughly 10-year lifespan of my next car, so as to mileage, frankly, I don’t give a damn. You’re in luck – at least as regards the loathsome stop-start system (even the otherwise brilliant Mercedes C I had last week had it). The Hyundai doesn’t. Expect it to by 2018. Sure seems like Hyundai is out there to eat Toyota’s and Honda’s lunch. Both the Japanese brands don’t seem to be at the top of their games anymore, distracted by uncle’s many mandates. This is a nice rig, if you need a crossover… except for the saaaaaaaaaaaaaaaaaaaaafety crap. I can’t abide that. But they all have this, to varying degrees. The Soobie saaaaaaaaaaaaaaaaaaaaaaaaaaaaaaaaaaafety crap is even worse. And if its like the airbag situation, you can’t and won’t find someone to turn them off if they don’t turn off (at some point they won’t be optional and won’t be able to be turned off). The government and insurance mafia makes those people liable for what could happen, so no one will do it. So its a defacto ban on making changes to your own vehicle. They don’t even NEED laws anymore. WHY DOES IT ONLY PISS OFF THE READERS OF THIS SITE! Why do we have to wait until its too late to stop this sh*t? At this point people won’t wake up until they are being lead into camps…………..
WHY DOES IT ONLY PISS OFF THE READERS OF THIS SITE! Because we are drivers, not pinheads who need technology to do everything for them. Take heart, rich, when the shtf, we’ll be the only ones able to drive away! Because very few people resist the social conditioning and even fewer pay the price for speaking against it. But it’s conspiracy theory to realizing there are people actively trying to shape society. Besides all that “cloverific” warning chime nonsense, does that LWB version really seem like it can handle 5,000 lb towing? Or is this one of those exaggerated Hyundai claims? I like the idea genuinely of a crossover that can handle anything more than an inflatable trailer. I assume so. I didn’t hook up a 5,000 pound trailer to test it, but even if I did, I’m sure it’d be ok… the iffy thing is how will it be after the warranty expires? I’m leery of pulling anything heavy with a FWD-based anything. Why would FWD handle worse than RWD when pulling 5,000 pounds? Well, having the tongue weight over the drive wheels should improve traction, for one thing. I really think it’s all about the weight, though. 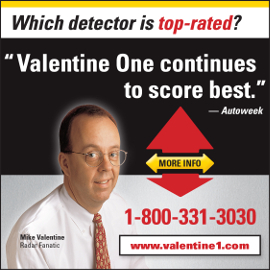 My old RWD Volvos towed fairly well, but once you got over 3,000 pounds, it really labored. Plus, the brakes really weren’t designed for that kind of load. I suspect it’s even worse on these newer fwd. I didn’t even think off the FWD aspect, there’s the deal breaker right there, although it was unlikely I was going to end up with one in the near future. Re: Warranty, I’ve known 2 people with 2012 Hyundai/Kias, and they’re not holding up well. Both V6s, one Sportage, one Santa Fe, both around 100k. Drivetrain is holding up, but lots of little sensors and gizmos going the way of the earth. I do quite like the Santa Fe though still, nice thing to drive and decent fuel economy.